This morning I woke up early to look for an egg. 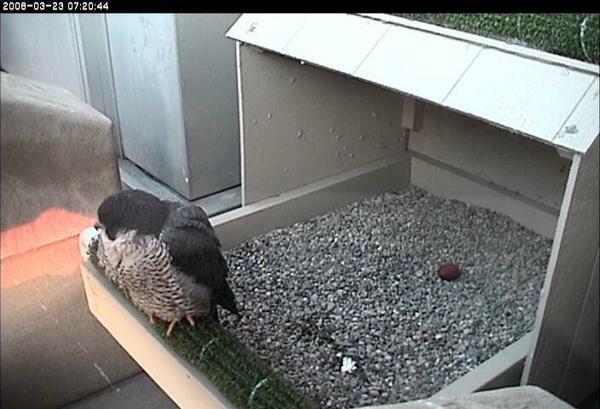 Last night before I went to bed I saw that Dorothy, the female peregrine at University of Pittsburgh, was on her nest. That probably meant she was going to lay an egg before dawn. Sure enough, here she is on Easter morning with her first egg of 2008. Congratulations! Dorothy just laid her second egg at approx. 2:15 p.m. Tuesday! We were outside on Tuesday around the same time. We work at Carnegie Museum in Oakland and are always on the lookout for the peregrines flying around the building, over Panther Hollow, going for pigeons, etc. We saw the courtship flight, too – including dive-bombing and other impressive swooping, a mere 20 feet over our heads in the museum parking lot!